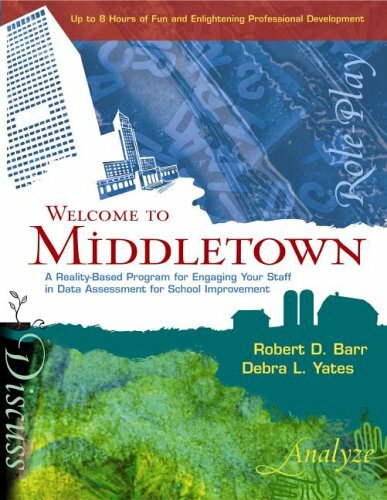 Barr, Robert D.; Yates, Debra L.
Welcome to Middletown is an exciting new approach to professional development. It introduces educators to the sophisticated world of assessment through a unique and fun instructional design. Rather than emphasizing math, statistics, ratios, graphs, and a complex vocabulary, it uses a reality-based role-playing format to engage workshop participants in the real experiences of a school district. Welcome to Middletown make the human issues of school improvement come alive. Understand the importance of assessment data and learn about the problems associated with using aggregated or composite data and school or district averages that often distort reality. Learn the dangers of decision-making, program evaluation, and strategic planning in the absence of essential data. Learn how data can be manipulated to present very different conclusions, and learn the importance of communicating assessment results effectively. Learn to use disaggregated data to establish goals, monitor progress, and evaluate personnel, programs, and school or district effectiveness. Learn that data must be questioned, analyzed, and interpreted, and learn that different personal philosophies, biases, or agendas can lead to very different conclusions. Gain experience in developing testable goals and objectives. Return to their schools and communities armed with more effective skills for using assessment data to evaluate the effectiveness of their school programs. Robert D. Barr Ph.D., is a nationally recognized scholar, speaker, and author. He is the former director of teacher education at Indiana University and dean of the College of Education at Oregon State University. He is currently senior analyst for the Boise State University Center for School Improvement. Debra L. Yates, Ed.D., has facilitated workshops and simulations throughout the United States and is recognized for her energy, humor, and effectiveness in working with groups. She is a former high school teacher and has also served as a professional development facilitator for the Indiana Department of Education. Currently, she is a visiting assistant professor in the Education Department at Albertson College of Idaho.